It's here!! The SOSF tea party event!! The lovely and talented Tara is admin of this new SOSF event (she made this incredibly gorgeous invitation and thought of this genius theme)! "This event's theme is "Handmade card, favorite tea and a treat"! (One of each.) To keep mailing costs low, be creative with light-weight, flattish items that you personally enjoy and will fit into a small, padded envelope. For example- a couple of packets of your favorite tea, with your great-aunt Tursell's recipe for scones or petit-fours tucked into a beautiful, handmade card in which you write your own tea rituals to share with your recipient. Add a wrapped piece of gourmet chocolate or biscotti, or something non-edible, but tea-themed as a *treat* and you will be set! 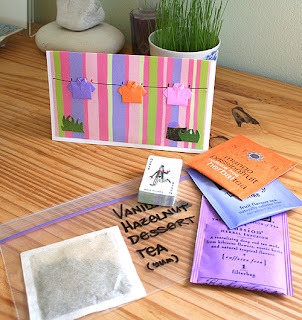 This is just one possibility - use your creativity and love of sharing tea with friends." For more information visit the SOSF blog!! This in not an event to be missed!! 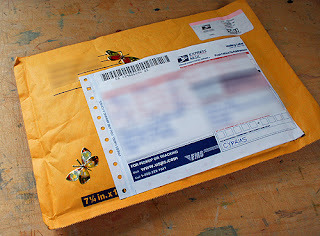 A few days ago I was visited yet again by those creatures of the fairy world: the black crow delivery service!!!! They brought me a sapphire treasure from far away made by a very talented young jewelery designer: Toby of Natural Attril!! It is truly gorgeous and I love it: A huge thank you to Penny and Toby for their lovely gift!!! 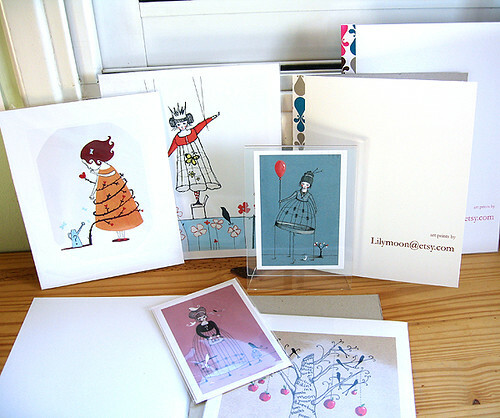 Etsy has been a lot of work, but I have really been enjoying creating prints for the shop! !